NurtureShock – A Book Review | How Do You Do It? 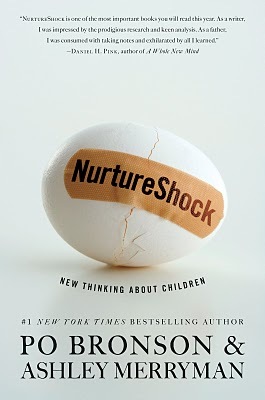 NurtureShock: New Thinking About Children is the book that has most influenced my approach to parenting. Po Bronson and Ashley Merryman pored through child development, psychology and eduation literature and highlighted some major ways in which our generation, in trying to do right by our kids, may actually be doing them a disservice. This isn’t light reading. There’s a lot of information packed in there. The authors report on a lot of practical, relevant research and some philosophically fascinating research. With that second category of information, it’s up to us to figure out practical applications in parenting. Each chapter of the book could easily be its own book. There’s little coherence between the chapters, but that’s okay. It’s not like I had the time to read it in one sitting! Sure, he’s special. But new research suggests if you tell him that, you’ll ruin him. It’s a neurobiological fact. In one study the authors cite, Dr Carol Dweck’s team gave a group of children a pretty easy test to complete. Half the kids were praised for their smarts, and the other for their effort. They were then offered a choice of two puzzles. The harder one would teach them a lot. Ninety percent of the kids who’d be praised for working hard chose the harder puzzle, while most of the other group elected the easier one. Kids who know that they’re smart are more likely to give up when they need to put forth effort. Guilty. I was that kid. I’d always been a good student and studied hard, but freshman chemistry in college was the first class in which I was frequently stumped. It took an enormous effort of will for me to stick with it, and the shock of not being the best student in the class hit my sense of worth hard. I’d always been the smart kid; needing to study stole from me the core of my sense of self. It was quite the fall. Kids who feel valued for being hard workers are likely to stick things out and take greater pride in their accomplishments. My children have been consistently labeled as gifted. I am so glad that I read this book before they started elementary school. Instead of praising my girls for being at the head of their class, I talk to them about doing their best. I’m not disappointed if they come in last if they try their hardest. Doing a lazy job and getting the highest grade in the class? That isn’t an accomplishment. Not buying it yet? Check out this passage from the chapter. By the age of twelve, children believe that earning praise from a teacher is not a sign that you did well–it’s actually a sign you lack ability and the teacher thinks you need extra encouragement. Around the world, children get an hour less sleep than they did thirty years ago. The cost: IQ points, emotional well-being, ADHD, and obesity. This is a hard one for me. It’s so hard to make enough time for sleep, getting home as late as we do, as much as the kids drag their feet getting ready for bed, as late as their bedtime conversations last. I struggle to value sleep; it just feels like this thing that takes away from the time I could spend living life and getting things done. Even more alarming is the fact that after pre-school, children are getting an entire hour less sleep every single night than we did as children. In fact, the authors suggest that the teenage moodiness may be mostly the result of chronic sleep deprivation. Does teaching children about race and skin colour make them better off or worse? This chapter was really uncomfortable to read. My ex-husband and I must be America’s whitest brown people. His father is of Mexican descent, and his mother is Caucasian. My parents are both Bengali, South Asian – Indian, if you must, although we’re actually from Bangladesh. Neither of us has ever encountered real racism; both military and university environments are meritocracies and we both grew up in open-minded, accepting school systems with open-minded, accepting peers. NurtureShock‘s authors convincingly argue that we’re wrong to refuse to talk about race. They argue that humans look for patterns. Kids don’t assume that groups are random. They look for commonalities and draw conclusions, and it us up to us as parents to encourage them to evaluate their assumptions. If we don’t talk about the generalizations they’re making, they stick. Bronson and Merryman argue that school desegregation doesn’t bring an end to racism unless race is actually discussed. An example they gave was of an elementary classroom spontaneously discussing Santa’s race after being read a book in which Santa was depicted with black skin. Bronson and Merryman state, “All minority parents at some point tell their children that discrimination is out there, but they shouldn’t let it stop them.” (p. 63) This doesn’t jive with my minority family experience. It was only after reading this chapter that I began to dive into the history of discrimination. They’ve since studied the Civil Rights movement at school. A few weeks ago, my 7-year-old daughters and I had an interesting conversation about affirmative action and whether it still has a place in our society. That would have never come up had I not read this chapter. We may treasure honesty, but the research is clear. Most classic strategies to promote truthfulness just encourage kids to be better liars. When I read this chapter, I was kind of disappointed. I was looking for research-based suggestions on how to teach our children about the value of truth, while also helping them gauge what truths should be spoken where. Parents who have faith in their children’s inherent honesty will certainly be shocked by how much good kids lie. They don’t want to disappoint us and they don’t want to get in trouble. So they lie. Millions of kids are competing for seats in gifted programs and private schools. Admissions officers say it’s an art: science says they’re wrong, 73% of the time. This chapter was hugely influential for me. My kids are among those who were identified early as gifted. Had I not read this chapter, I would have probably sat happy on those laurels. What I learned, though, was commonsensical enough. Kids bloom at different times. A child who is super-precocious as a 5-year-old may be an average student by middle school. The kid who doesn’t stand out in 1st or 2nd grade may burst into brilliance as a 5th grader. However, our school systems only looked for giftedness once, early in elementary school. We end up with kids in gifted programs who would do better in regular classrooms and miss out on nurturing other children’s genius. Even worse, the measures of giftedness are limited and miss out on things like emotional intelligence. When I was researching schools for my daughters, I ended up choosing the school district that would allow children into their Gifted and Talented program even if their gifts manifested in only one academic area. While I knew my daughters would qualify in all areas, I wanted them in a program that valued uniqueness and understood that children are individuals. In December, I read A Parent’s Guide to Gifted Children , which I’ll review tomorrow. When I was telling my daughter M about it, she observed that her teacher was likely good at teaching gifted children because her own daughter was so smart. Her teacher’s daughter is one of the most emotionally intelligent and insightful children I have ever encountered, but she doesn’t test particularly well. She’s struggled with math and reading. I knew that M’s ability to see her friend’s gifts, despite their not being the ones that most schools acknowledge, was a sign that we were doing something right. Freud was wrong. Shakespeare was right. Why siblings really fight. This is the chapter for MoMs. One observation is that sibling relationships stay qualitatively similar over time, at least as long as they’re living together. Those of us with kids who adore each other now can be pretty confident that their connection with stand the test of time. The bad news is for those whose kids mostly ignore each other. Interestingly, fighting a lot isn’t necessarily bad, if it’s balanced out by fun, fun, fun times. Conflict prevention is the key, not conflict resolution. Kids as young as four can be taught the skills needed to get along with their siblings. Siblings who can work things out without needing parental intervention are in good shape. The sibling relationship is its own thing, not some reflection of each child’s relationship with their parents or sharing parental attention. Here’s a showstopper: “One of the best predictors of how well two siblings get along is determine before the birth of the younger child… [The] predictive factor is the quality of the older child’s relationship with his best friend.” Those of us who have multiples first seem to have a major advantage here. Why, for adolescents, arguing with adults is a sign of respect, not disrespect – and arguing is constructive to the relationship, not destructive. If your teen argues with you, it’s because she still cares about your opinion. The kids who agrees with you all the time is just ignoring you as soon as you’re out of sight. Mind. Blown. As you’ve probably heard elsewhere, teenagers’ brains just don’t work like adult brains. There’s no point expecting them to. We don’t expect that of our two-year-olds, right? Chapter 8: Can Self Control Be Taught? Developers of a new kind of preschool keep losing their grant money – the students are so successful they’re no longer ‘at-risk enough’ to warrant further study. What’s their secret? I found this chapter less coherent that the others. Teens make bad decisions. A bunch of teens together make such insanely bad decisions, it’s crazy. Young children can be taught self-control by being empowered to set their own boundaries and practicing holding themselves to those boundaries. Tools of the Mind sounds like an amazing educational approach, but good luck finding a school that uses it. Why modern involved parenting has failed to produce a generation of angels. There’s a fascinating insight in this chapter about kids’ TV. Modern children’s educational TV programs, despite attempting to teach positive behaviour, does the opposite. So much time is spent building up a conflict and so relatively little time spent resolving it, the kids absorb the conflict and not the resolution. One way to address it? Let your kids see you fight so that they can see you resolve conflict. If you agree with your spouse not to fight in front of the kids, they still pick up on the tension, but never get to learn from you how to make up. Let your kids know that conflict is a normal part of human life… as is resolving it. Despite scientists’ admonitions, parents still spend billions every year on gimmicks and videos, hoping to jump-start infants’ language skills. What’s the right way to accomplish this goal? Perhaps it’s because my academic background is in linguistics, but this chapter didn’t do anything for me. Social interaction is critical to language development. Responding to your child, even before the child can produce meaningful speech, helps him learn to speak. Reponses can be verbal, tactile, eye contact. All of it matters. This book has no that-explains-everything insight. Raising kids is a complex exercise. There’s no one aspect of childhood that fixes everything if you tweak it just right. Well-rounded parenting helps kids. Pretty straightforward, that, but there were a lot of good details along the way. I just picked up my copy of this book from the library today. You’ve been talking about for so long, I decided to put it on hold, even before I read this review. And your review makes me want to read it even more! Thanks! I can’t wait to read this one too. Reserving my library copy now! I’m so intrigued by many of the topics. Thanks for the review, Sadia! 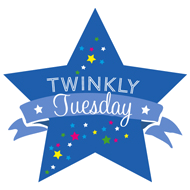 Pingback: Parenting Book Review Theme Week and Giveaways! !